A Miami 4-year-old's performance at a Pre-K graduation has gone viral. 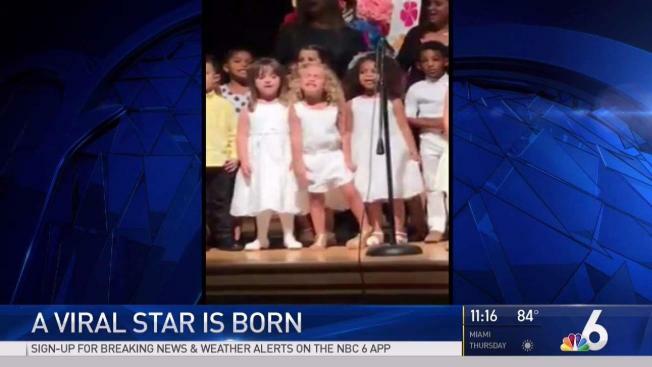 At a Pre-K graduation, classmates sang “How Far I’ll Go” from Disney's "Moana" to conclude their graduation ceremony earlier this month, 4-year-old Sophia from Miami kicked it up a notch. Once the song started, Sophia bent her knees and threw her hands into the air, enthusiastically singing along. Her mom captured the entire performance and posted the video on Facebook, where as of Tuesday it has received 13 million views. The rest of Sophia’s classmates similarly sang along and danced, with some swaying side-to-side. But from the outset, Sophia established her presence on the front of the stage. NBC 6 spoke with Neshin about her daughter's viral performance. "She's always a spunky and fun kid, but we did not expect her to do that on stage," the mom said. She added that when she first posted the video she never expected it would go viral.